Once again I write about a very rare diver. This is the ref. 756 ladies automatic diver. This is the very first serial production diver from Heuer along with the French made ref. 844. It's a tiny little watch at just 28mm. 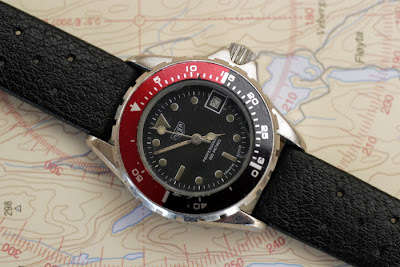 This first edition ladies diver had a very cool black and red bezel, and the dial is printed "Ebauche Suisse" at the bottom. The later ref. 756 has an all black bezel and "Swiss Made" on the dial. 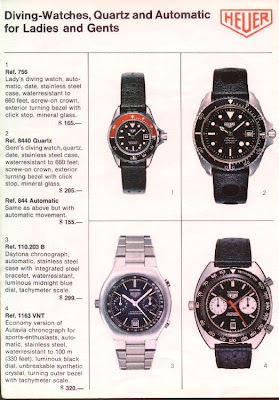 She was "cover girl" on the 1979 Heuer catalogue together with the ref. 844. 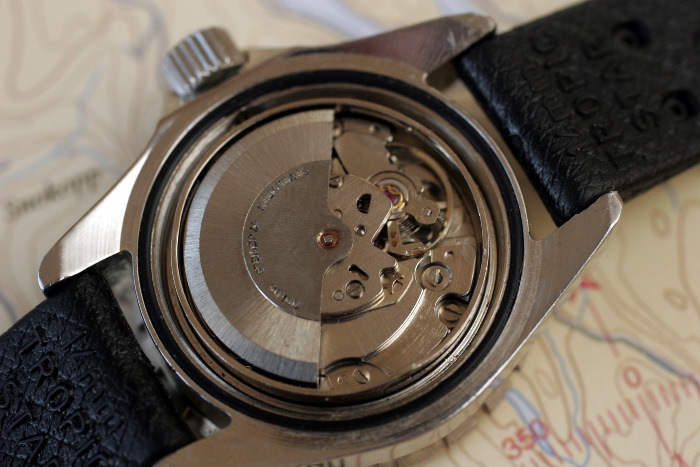 The automatic movement is not signed Heuer. I have not managed to identify the maker. 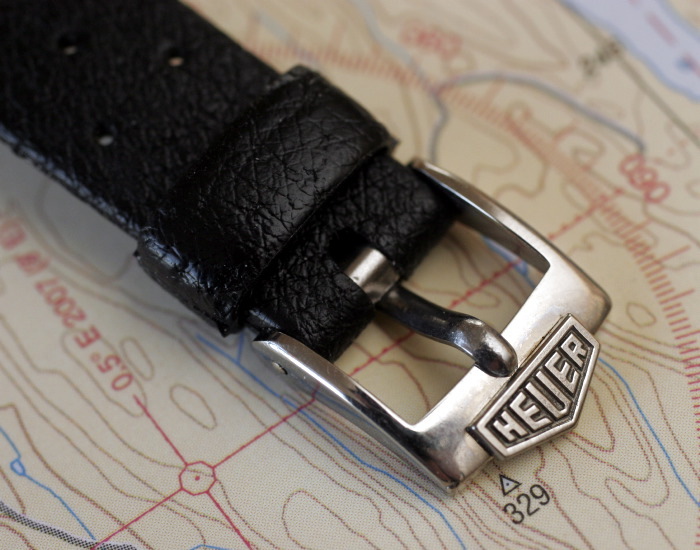 The original strap is a 14mm Tropic strap with a original Heuer 12mm buckle. Very cool and rare combination. Another scan from the 1979 catalogue. These small automatic ladies divers are very rare. This is the only one I have seen in the six years I have been collecting Heuers. 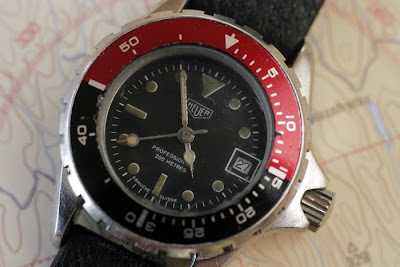 I have seen a few of the later black bezel Heuer / Tag Heuer version, but only this one of the first edition. 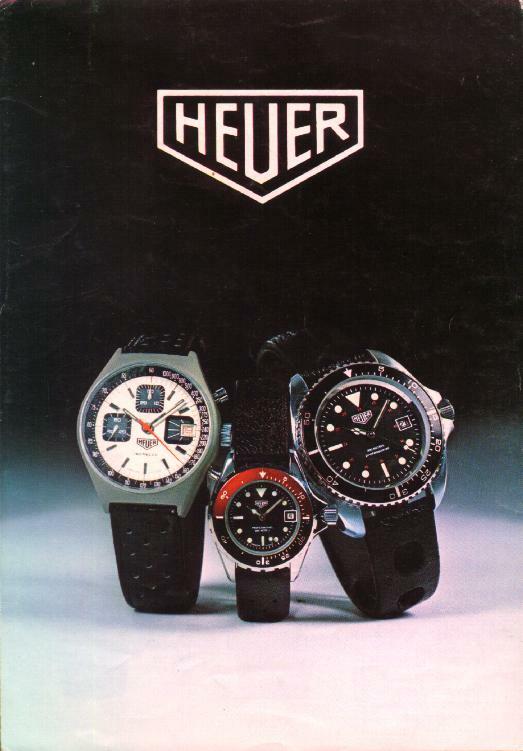 Many people likes Heuers spcially classic heuers. I think its because of the quality and style. Hi - I have an old ladies Heuer that I use to wear when surfing. It is a 756, all black (no red). The thing is it says "Made in France" on the bottom front. Also on the front, it has PROFESSIONNEL 200 Metres. On the back it has 13881 and 756 and Acier and 20 ATM and EIANCHE. It is pretty worn so hard to read the back. Also, no strap. Do you know the history on this one? Hi, the one you got with the all black bezel is a little later version than mine with black/red bezel. Only the very first production was with the black/red bezel. It was sold some time ago. 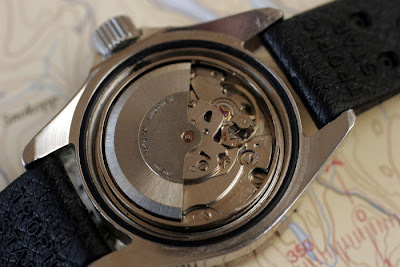 Have a perfect classic Tag Heuer 756 for sale what are they worth?